CMP Catheter Storage Cabinets are the solution to your catheter storage needs. Continental Metal high quality Catheter Storage Cabinet will meet the requirements of Hybrid ORs, Cath Labs, EP Labs and IR. Catheter Storage and Supply units are manufactured in Recessed, Mobile or Freestanding models, with flat or slope top. CMP Catheter Storage Solutions will be customized and configured to your unique requirements. 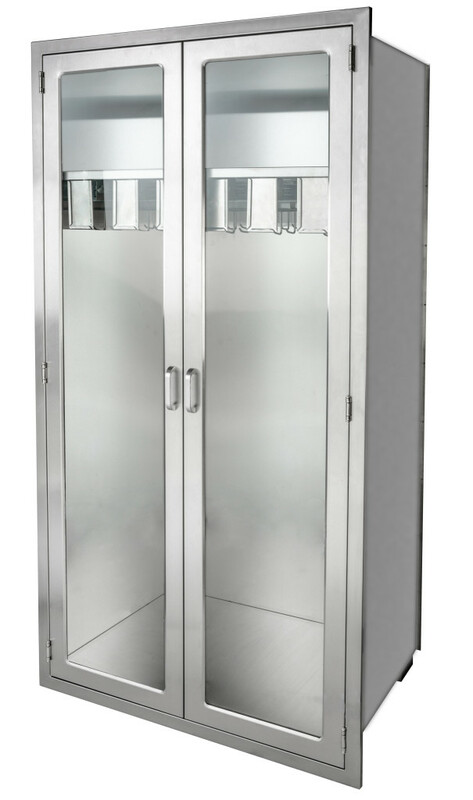 CMP Stainless Steel Catheter cabinets provide the utmost in Accessiblilty — Each catheter slide offers full extension, which brings the catheters into full view. The full extension provides Cath Lab professional quick access and visual inventory of remaining stock. CMP’s most popular 24″ deep model provides catheter slides that are 21” long and contain six hooks. 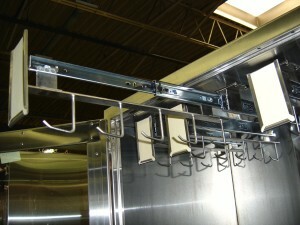 36” wide cabinets are configured with up to six rows of catheter slides. 48″ wide cabinets are designed with up to eight rows of catheter management hook systems to hang inventory for quick visual access. Each Catheter slide accommodates 10 to 15 catheters per hook. As many as 800 catheters can be stored in one single cabinet. Wider packaging can also be accommodated via adjustability from side-to-side. Customized Catheter management can be set up with double rows of catheter slides for shorter catheters. Stainless Steel cabinets is the best practice for catheter storage, due to the invasive nature of the procedures in these departments. For medical applications, hygiene is the highest priority and therefore stainless steel is the choice of material which offers the most hygienic, easy to clean surface. Catheter Storage Cabinets shall be full-height storage cabinets for either free-standing or built-in installations. Full-view doors shall allow complete visual inspection without blind areas caused by cross pieces. Cabinet shall be of Type 304, 18 gauge (1.2mm) stainless steel with Heliarc-welded construction. Welds shall be ground and polished to No. 4 finish. Cabinets shall include catheter slides for storage of catheter equipment. Quantity and location of slides are determined by customer requirements and will be mounted to the top of the cabinet or the bottom of a fixed shelf. Slides pull out fully to allow easy access to all stored items and include label holders. Depending on the depth of the cabinet, each slide will contain 4 or 5 hooks for storage of equipment. Two full-height, glazed doors shall be provided with stainless steel perimeter frame, Heliarc-welded to form rigid structure and polished to No. 4 finish. Doors shall have ¼” (6mm) thick shatterproof, safety glass panes. Doors shall be supplied with chrome plated pull handles, hinges and roller catches. Catheter storage can be combined with a wide variety of modular baskets and trays. 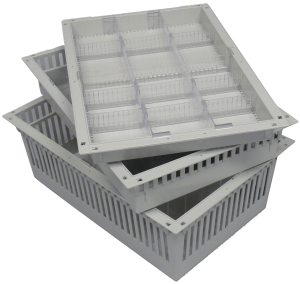 These leak proof, low weight storage trays offer infinite options foe great efficiency in surgical storage due to the availability of adjustable dividers. Available in ABS grey, PC transparent and coated wire. sizes include; 23-5/8″ x 15-3/4″, in heights of 2″, 4″ and 8″. 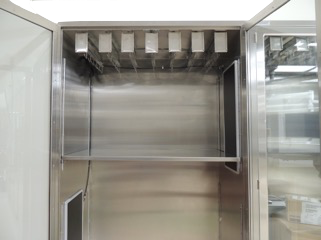 Cath Labs and Hybrid Operating Rooms combine catheter storage with adjustable stainless steel shelves. Depending on requirements, shelves can be included in the catheter cabinet to optimize storage above or below catheter slides. Additional shelves can be ordered for existing Catheter Cabinets. Sloping Dust Top – No. 20 gauge (0.9 mm) stainless steel for freestanding installations. Note: The 72” ( 1829 mm) high cabinets contain one fixed intermediate shelf.